Between Here & There (67'10") by Brian Parnham opens with reassuring warm and bright harmonic motion. As layer upon layer of silvery synthesizer chords rise like billowing clouds on the horizon, his music evokes the beauty of a desolate and majestic desert landscape. Abandoning the safety of consonant synthesizer pads, Parnham soon follows a path inward toward the dripping interior workings of a contemplative mind. Within the dreamy sensibility we follow sonic figures in a more cerebral panorama. Barren minimalism transforms into detailed scene as long, unbroken stretches of tones expand around the listener. Throughout this section Parnham utilizes an impressive array of sounds and sources to form an incongruous yet engrossing imagery. Between Here & There navigates the area between mysterious mind music and tranquilizing New Age. 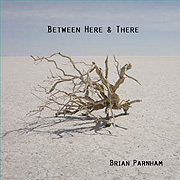 Like the arid region which inspires his music, Parnham's work possesses the stark beauty of desert badlands as well the capacity for becoming lost in its expansive reaches.